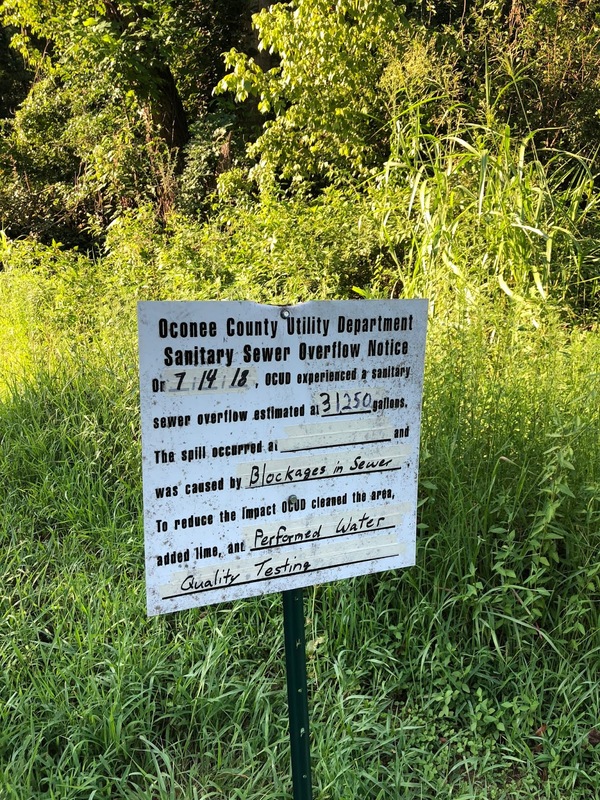 An estimated 31,250 of untreated sewage spilled into a tributary of Calls Creek on Saturday as a result of a blockage in a sewer line on Experiment Station Road near the Sheriff’s Office in Watkinsville. Tim Durham, newly named Water Resources Department director for the county, said that the Georgia Environmental Protection Division has been notified of the spill. Durham said the cause of the blockage in the line was a flow meter strap that had become dislodged in the pipe. The Water Resource Department is trying to eliminate inflow of storm water to the pipes in the system and is using flow meters for that purpose. The county says that the required water testing was undertaken. Results of tests have to be reported to EPD when they are complete. The spill was on a small tributary on the southern side of the main branch of Calls Creek, a short distance from where the main branch of the creek crosses under Experiment Station Road after flowing through Harris Shoals Park. The expansion trap that is part of the flow meter dislodged in the pipe, causing a blockage and forcing the raw sewage through a manhole, Durham told me in an email message on Monday. The expansion strap is normally placed inside a collection pipe in order to calculate flows, Durham said. The county has contracted with Barge Design Solutions, with offices in Peachtree Corners, outside Atlanta, to help it with the study of inflow to pipes from storm water, but Durham said the flow meter may have been installed by Barge Solutions or by county staff. “Most likely something that flowed through it jarred it loose,” Durham said. The Lampkin Branch of Calls Creek joins the main Branch a short distance from the spill. A gravity-fed sewer line runs down Lampkin Branch, carrying sewage from the commercial complex on Epps Bridge Parkway. 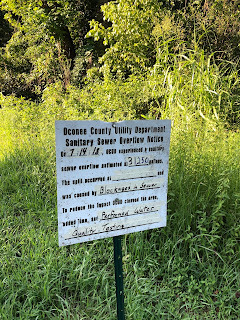 The gravity line then runs along the main branch of Calls Creek to the county’s only wastewater treatment plant, which is on the north side of Watkinsville at 1100 Durhams Mill Way. A new, 1.5-million-gallons-per-day wastewater treatment plant is nearing completion just to the side of the existing plant. Board of Commissioners Chair John Daniell told me in an email message today that no firm date has been set for the switchover to the new plant, but it should be made some time in August. In January, the county experienced a major spill when operational problems at the existing plant caused a discharge of partially treated wastewater into Calls Creek. The existing plant uses a sensitive membrane filtration system that is worn, and the county has been nursing the membranes along in anticipation of the decommissioning of the plant next month. The new plant will use a more traditional form of biological treatment. On February 5 and 6, 2018, the plant exceeded permit limits for total suspended solids in the effluent concentration of wastewater discharged to Calls Creek. The event appeared to be the result of peak flow rates exceeding the plant’s design hydraulic capacity and upsetting sludge blankets in the clarifiers, according to the county’s report.